All activities are online and interactive: word activities (crosswords, word searches), quick fun games (quizzes, colouring in, jigsaw puzzles, simple activities), multimedia games and experiences. Includes some videos. 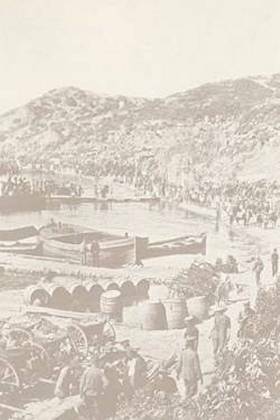 A special Gallipoli-themed educational website from Australia Post. Work out who the six Australians are (includes some Gallipoli people). For more early childhood activities websites, see our Early childhood activities page. From the ABC: "You'll be able to explore both Anzac and Ottoman perspectives alike, and examine in detail the experiences of individual soldiers throughout the day, as well as the military technology of the time." Includes a special layer using Google Earth. Gallipoli: The First Day is now available as an app. Scroll the ABC's web page down slightly to see the links to the App Store, Google Play (Android), Amazon and the Windows Store. Focuses on using the ABC's website Gallipoli: The First Day. Select a battle and see photographs and summaries. For Gallipoli and Lone Pine, either click on the location of Gallipoli, Turkey, on the map, or click on the arrow in the bottom right corner, then on "GALLIPOLI". Includes Gallipoli video footage. "Through animated documentaries, video, audio and activities you can re-live some of the greatest events in our history, as seen through the eyes of the men and women who were there." School registration will allow students to use an online interactive book for research and other activities, where possible relating to the particular soldier a student has selected. Portions of the book may be downloaded and printed. Registration is free, although the website encourages donations. Worksheets and information. Designed for primary students. Download the complete publication or the four components separately. A DVD-ROM (ryebuck.com.au) related to this material is available. Move the cursor over a photograph to see how that part of Gallipoli looked in 1915. - Why Did the Anzacs Land at Gallipoli? Go to our INTERACTIVE QUIZZES PAGE. Move mouse over image and click "Color online". Presented mainly with Remembrance Day in mind, but the poppy theme makes these activities suitable as Anzac Day activities. Online jigsaw puzzles primarily designed for Remembrance Day.